The Open Group and the IFDC hereby authorize you to use this document for any purpose, PROVIDED THAT any copy of this document, or any part thereof, which you make shall retain all copyright and other proprietary notices contained herein. This document may contain other proprietary notices and copyright information. Nothing contained herein shall be construed as conferring by implication, estoppel, or otherwise any license or right under any patent or trademark of The Open Group or the IFDC or any third party. Except as expressly provided above, nothing contained herein shall be construed as conferring any license or right under any copyright of The Open Group or the IFDC. Note that any product, process, or technology in this document may be the subject of other intellectual property rights reserved by The Open Group or the IFDC, and may not be licensed hereunder. This document is provided “AS IS” WITHOUT WARRANTY OF ANY KIND, EITHER EXPRESSED OR IMPLIED, INCLUDING, BUT NOT LIMITED TO, THE IMPLIED WARRANTIES OF MERCHANTABILITY, FITNESS FOR A PARTICULAR PURPOSE, OR NON-INFRINGEMENT. Some jurisdictions do not allow the exclusion of implied warranties, so the above exclusion may not apply to you. Any publication of The Open Group and the IFDC may include technical inaccuracies or typographical errors. Changes may be periodically made to these publications; these changes will be incorporated in new editions of these publications. The Open Group and the IFDC may make improvements and/or changes in the products and/or the programs described in these publications at any time without notice. Should any viewer of this document respond with information including feedback data, such as questions, comments, suggestions, or the like regarding the content of this document, such information shall be deemed to be non-confidential and The Open Group and the IFDC shall have no obligation of any kind with respect to such information and shall be free to reproduce, use, disclose, and distribute the information to others without limitation. Further, The Open Group and the IFDC shall be free to use any ideas, concepts, know-how, or techniques contained in such information for any purpose whatsoever including but not limited to developing, manufacturing, and marketing products incorporating such information. If you did not obtain this copy through The Open Group or the IFDC, it may not be the latest version. 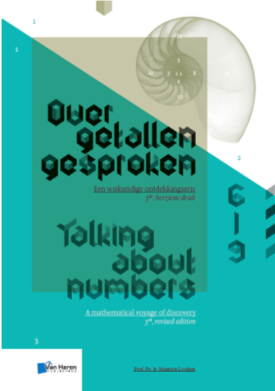 For your convenience, the latest version of this publication may be downloaded at www.opengroup.org/library or www.verism.global. ArchiMate®, DirecNet®, Making Standards Work®, OpenPegasus®, Platform 3.0®, The Open Group®, TOGAF®, UNIX®, UNIXWARE®, and the Open Brand X® logo are registered trademarks and Boundaryless Information Flow™, Build with Integrity Buy with Confidence™, Dependability Through Assuredness™, Digital Practitioner Body of Knowledge™, DPBoK™, EMMM™, FACE™, the FACE™ logo, IT4IT™, the IT4IT™ logo, O-DEF™, O-PAS™, Open FAIR™, Open O™ logo, Open Platform 3.0™, Open Process Automation™, Open Trusted Technology Provider™, SOSA™, and The Open Group Certification logo (Open O and check™) are trademarks of The Open Group. COBIT® is a registered trademark of ISACA and the IT Governance Institute. ITIL® is a registered trademark of AXELOS Limited.VeriSM™ is a trademark of the International Foundation for Digital Competences (IFDC). All other brands, company, and product names are used for identification purposes only and may be trademarks that are the sole property of their respective owners. 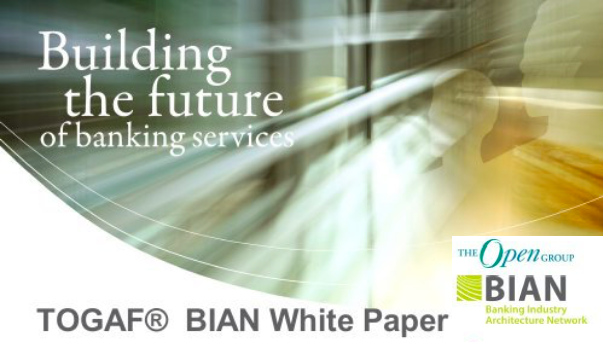 This White Paper has been written to help organizations and professionals understand how The Open Group IT4IT™ standard and the IFDC VeriSM™ approach can be used together to help organizations improve their services and achieve their desired business outcomes. It provides an overview of the two and their synergies and closes with a scenario for how to use them together for business benefit. The digital era is firmly upon us. Technology is not only an important part of almost every business today, but it is also embedded in society and how we interact with each other in our daily lives. This presents massive opportunities for businesses to completely transform the way they operate. The inability of organizations to embrace new technologies in a timely way is one of the key reasons why over half of the Fortune 500 companies have disappeared since 2000.1 Organizations that ignore digital developments do so at their peril. All of this makes renewed demands on organizations and the professionals that work for them. Both the IFDC VeriSM approach and The Open Group IT4IT standard have been developed against this background of Digital Transformation, with the aim of helping organizations and professionals to take advantage of the opportunities offered in this digital era as well as to manage the risks associated with it. Both approaches help organizations to improve their services and achieve their desired business outcomes – albeit from different perspectives. VeriSM and the IT4IT standard share the same drive to manage the new digital ecosystem, each having complementary perspectives which can be used very well together. 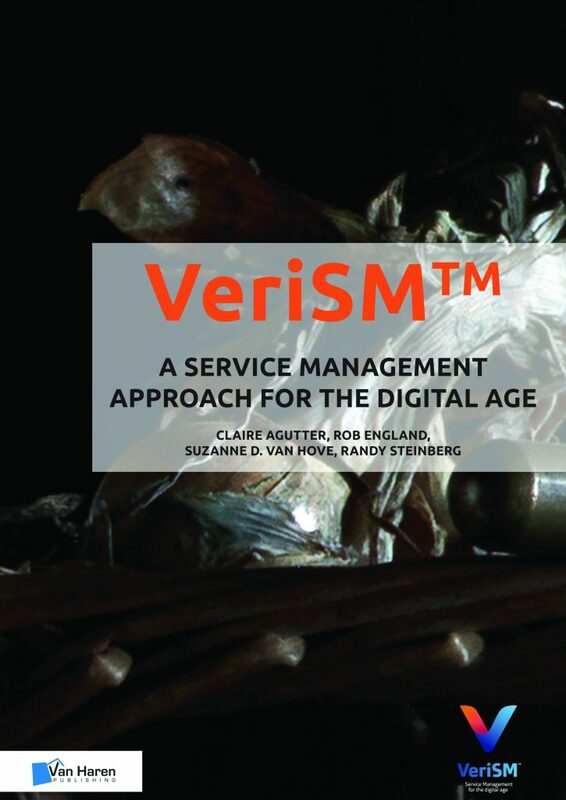 VeriSM is the company-wide service management approach for the digital age that helps service providers to create a flexible operating model in order to meet desired business outcomes. The VeriSM approach supports organizations in developing a service culture across the entire organization, not just in the area of IT. The VeriSM approach is very practical. It helps organizations to better select and apply management practices and technologies that support their daily operations and strategies, and to govern these under one integrated model. VeriSM is an umbrella approach and thus, by definition, vendor and framework-neutral. The Open Group IT4IT Reference Architecture is an industry standard reference architecture for managing the business of IT. It uses a value chain approach to create a model of all the functions needed to deliver value for the business. The IT4IT standard defines an integrated IT management framework focusing on the full lifecycle of services. It identifies the key things that IT must do – and do well. It allows IT to achieve the same level of business predictability and efficiency that supply chain management has allowed for the business, and was designed by practitioners to be industry, product, and vendor-independent. For each product or service, these areas are considered and the mesh is flexed where necessary. 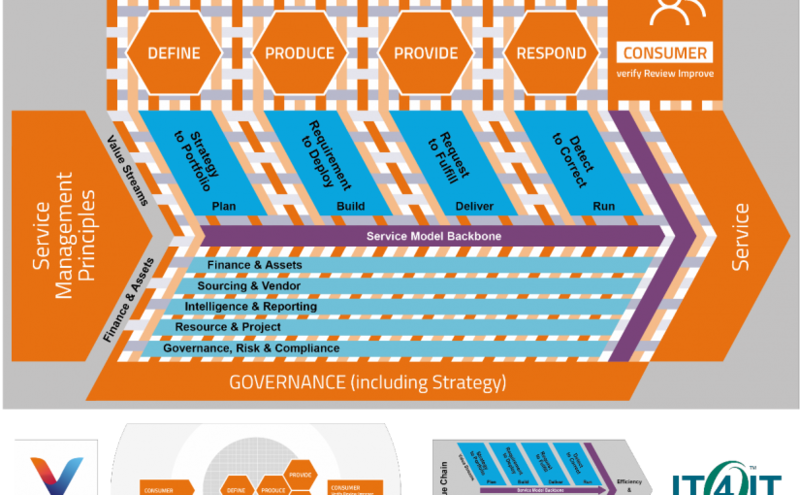 The key focus area of the IT4IT standard is to provide a blueprint for a modern IT operating model using a common information reference model. The IT4IT Reference Architecture defines how IT management functions in the IT service lifecycle should be integrated to enable value to the business. The focus here is on streamlining and automating IT activities across the end-to-end IT value chain and providing transparency and traceability. The IT4IT Reference Architecture helps ensure interoperability of IT management solutions from different technology vendors and different service providers. It provides guidance for IT on becoming a service broker to better manage the growing number of vendors that are part of our hybrid service delivery ecosystem. The core of the diagram depicts the value stream model contained in the IT4IT standard, with the service model backbone, the four main value streams, and the supporting activities. The VeriSM model has been wrapped around it, containing the overall organizational governance and service management principles, and resulting in the service as driven by the needs of the consumer. The four IT4IT value streams correspond very roughly to the main service phases as defined in the VeriSM model. The VeriSM management mesh, which helps organizations to pick the right mix of technologies and management practices for their individual situation and govern them all under one model, is running through the entire value chain. The IT4IT standard actually forms part of the management mesh, as it is one of the management practices which can help an organization to achieve its desired business outcomes. 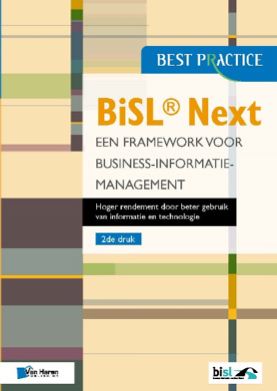 This section contains a practical example of how the IT4IT standard and the VeriSM approach can work in tandem to help an organization to reach its desired business outcomes. EnOrg is an energy provider which has been in the business for more than 40 years. EnOrg is a very stable, reliable provider but recent analysis has revealed that sales of EnOrg have decreased dramatically in the last five years. Further analysis has revealed that consumers are choosing alternative providers because EnOrg’s competitors offer innovative services which are not available at EnOrg. To address this, EnOrg has set up a Digital Transformation program. The program is wide-reaching and includes multiple initiatives which transform the way in which EnOrg develops, delivers, and promotes its services, making use of technology and digital means. The aim of the Digital Transformation program is to win back market share by delivering more value to its customers which in turn should help reshape EnOrg’s image, so it is seen as a modern provider on the cutting edge of innovation. As part of this overall program, a specific project was set up to develop an app which allows consumers to track their energy use (New App). New App has been developed by an external software development company, and EnOrg’s own internal IT department support it. The Marketing department was involved in the original design of New App, to ensure an attractive “look and feel”. New App relies on data from various sources across multiple suppliers. Upon launch it was well received in the market, but recently some problems have started to emerge. New App doesn’t always work and the various teams (both internal and external) don’t work well together and often blame each other for any failure, leading to a delay in actually resolving the issue. The internal IT department gives high priority to any issues with New App, as they understand the importance of it for EnOrg’s business, but the external software development company does not treat escalated issues with the same urgency. The various suppliers which feed data into New App use different tooling, which means that information flow is poor and sometimes employees even have to manually transfer data from one system to another which leads to additional delays. There have been a lot of complaints about the usability of New App, but the Marketing department considers their job is done and it is the IT department’s responsibility to make any necessary improvements. To make matters even worse, during the invoicing process, customer data was accidentally leaked to one of the suppliers which should not have had access to it. Management is considering withdrawing New App and employees and customers alike are frustrated. Figure 2 shows how VeriSM and the IT4IT standard can work in tandem to help solve the business problems of EnOrg and deliver the New App service effectively to its consumers. The following sections explain this in more detail. The consumer is central to VeriSM. The VeriSM model can be applied to help EnOrg adopt an organizational-wide approach to delivering the New App service to the end consumer. This will help to correct many of the silo issues which are occurring right now, and ensure that there is the right level of commitment across all areas of the organization. This includes developing the right behaviors across the organization (the service culture/mindset). Applying the VeriSM approach will also ensure effective governance of any third parties which contribute to the service, as these will also be governed under one integrated model. Strategic requirements, goals, and objectives are defined for the Digital Transformation program of EnOrg and the specific projects within it, including the New App service. A structure is established to assess progress against these (measurement). This ensures that there is sufficient management commitment to (and focus on) achieving the outcomes desired by the change, including how to foster a collaborative environment which is required to ensure that the New App service can be delivered and supported effectively. By applying the management mesh, EnOrg can also optimize the way in which it is using resources, considering its operating environment, and applying new management practices and technologies. This will assist EnOrg in keeping pace with the times in terms of innovation, which the consumer expects, whilst reducing cost and risk caused by unnecessary spend on new practices and technologies which are not the right “fit” and as such do not add sufficient value to EnOrg as an organization. Particular consideration is given to how to ensure knowledge transfer from the software development team to the internal IT department; how third-party resources are governed; and how to ensure that resources are made available from all involved teams, including Marketing which needs to continue to improve the “look and feel”/usability of New App. Attention is given to how to develop the right “culture of collaboration”, both within EnOrg itself and extended to its suppliers. A competitor analysis is performed to identify industry benchmarks and opportunities to differentiate EnOrg’s New App from similar apps already offered in the market, for greater competitive advantage. There is also focus on the alignment of processes and tools (service stabilizers) across suppliers/teams, to make sure all teams involved give high priority to resolving issues related to New App and that information can be quickly exchanged. As the New App service involves close collaboration between suppliers and teams, Service Integration and Management (SIAM) is adopted as a management practice to support EnOrg in managing a multiple supplier model. Also, Lean thinking is applied to identify how unnecessary waste can be eliminated from the app development and support processes, to prevent avoidable delays. The IT4IT standard is used to identify the value streams in the IT delivery and to streamline processes and systems. There is focus on cloud and automation solutions to ensure that tooling between the different suppliers involved in the New App service is automatically linked and that knowledge can easily be shared across platforms. 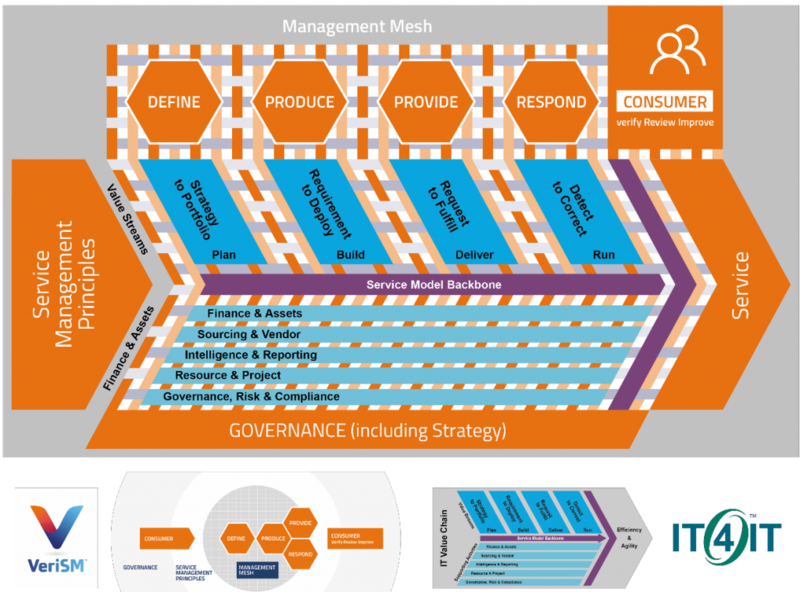 The management mesh can be continually flexed as needed, to allow EnOrg to respond to new consumer demands and changing market dynamics, as well as to embrace new (technological) developments where these add tangible value. The EnOrg organization can use the IT4IT standard to create a more holistic and integrated approach to manage the entire service lifecycle of all services in the portfolio. The problems experienced with the New App introduced by EnOrg are a symptom of a more fundamental issue about the way EnOrg is governing and managing services across the entire IT value chain, from planning, development, testing, through deployment to operations. The IT4IT Reference Architecture provides a blueprint to define a common model for enabling interoperability and communication between the different vendors involved in the ecosystem as each have their own processes and tools. 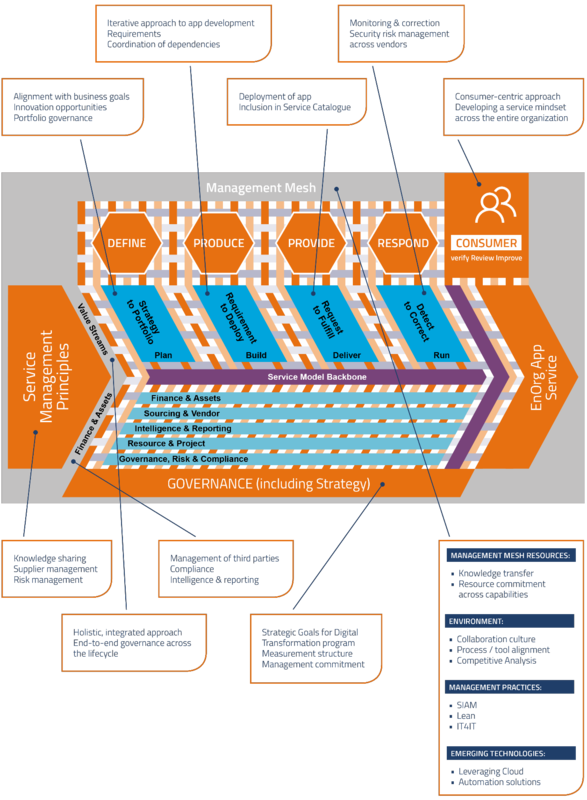 Standardizing on the IT4IT information model helps EnOrg to realize a multi- vendor sourcing platform ensuring end-to-end governance and traceability, which includes standard integrations with the service providers to, for example, exchange requirement specifications, incidents, and other lifecycle artifacts. This improves the communication and collaboration between the different vendors in the ecosystem. functions that are still being accomplished manually. The Strategy to Portfolio (S2P) value stream manages the portfolio of services and ensures these services are continuously evaluated and aligned with business goals and strategic themes. Within the S2P value stream, opportunities for innovation are identified and managed in the portfolio backlog. 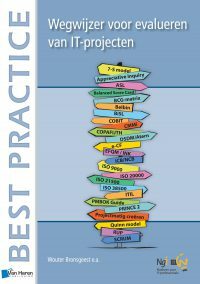 The transformation program of EnOrg is managed in this value stream. The portfolio of initiatives is governed in S2P ensuring the IT investments deliver the expected business outcome. One of the initiatives is to develop a new application which is added to the service backbone. The IT4IT service backbone manages the full lifecycle of all current and planned services and related technologies. The portfolio of services and initiatives in this value stream is related to strategic themes and business objectives. The Requirement to Deploy (R2D) value stream manages the product backlog and requirements across the different teams and services. 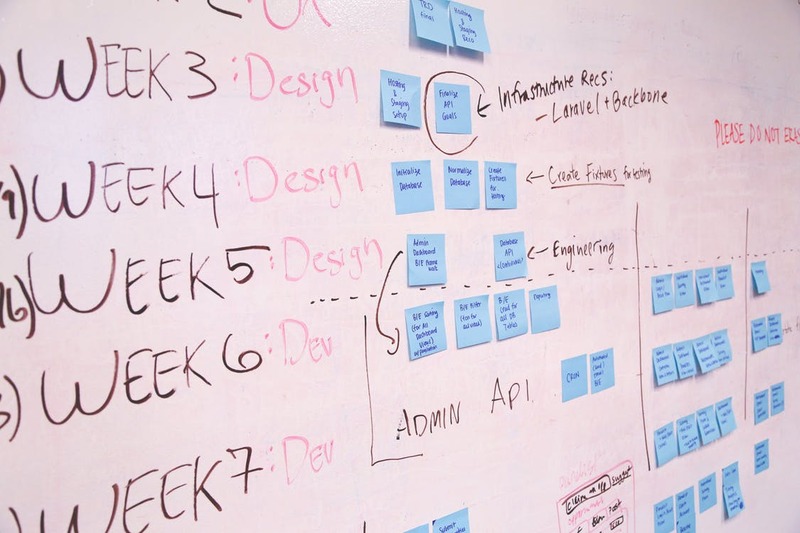 The actual sourcing or design, development, and test activities are performed in this value stream resulting in a service blueprint which can be deployed into the different environments. This value stream ensures that the New App is developed in an iterative manner, ensuring both business requirements and non-functional requirements are considered; e.g., including risk, security, compliance, and operational aspects such as user experience, performance, maintainability, and availability. This integrated approach ensures all requirements are tracked and traced in a common backlog and the design includes all dependencies and integrations needed to make the New App work in production. The dependencies between the application and other applications and teams/vendors are coordinated. The operational aspects of the service are embedded during the development phase; e.g., monitoring and how to handle service interruptions and integrations with vendors. For the New App a standard blueprint is created which includes the blueprint of all components needed to manage and operate the application as well as the underlying infrastructure (infrastructure as code) and the integration the application has with other data sources. This way a consistent service model is created of the New App with all dependent service components which makes it transparent and easier to identify the interdependencies between the different services and involved teams. The Request to Fulfill (R2F) value stream manages the service catalog and the various request fulfillment activities such as deploying infrastructure and application releases across the different platform and vendors in the ecosystem. This value stream performs the actual provisioning and deployment of the application, tracking usage, and moving the service from a desired service to the actual service in the IT4IT service model backbone once it is deployed. The Detect to Correct (D2C) value stream ensures continuous operations by proactively monitoring services and initiating corrective actions to prevent or remediate issues. This includes monitoring services from a business perspective (e.g., user experience) as well as related to security (e.g., threats and vulnerabilities), performance, and so on. The D2C value stream monitors the end-to-end service across the different vendors, as well as monitoring security and compliance of each of the vendors. For example, data leakage issues are logged and remediation actions are coordinated. The actual service data object in the IT4IT service model is used to pinpoint the root cause of specific incidents to service components and automatically route incidents to the responsible teams. Feedback loops are implemented to ensure identified issues can be fed back to the R2D value stream into the development backlogs. The Supporting Activities address disciplines such as governance, risk and compliance, vendor and sourcing management, resource and project, finance and assets, as well as intelligence and reporting. The vendor and sourcing Supporting Activity is involved in the negotiation and monitoring of the third-party contract for developing the new application. This ensures that all involved service providers and contracts are linked to the New App and continuously monitored to identify improvement opportunities. In conclusion, the IT4IT standard and the VeriSM approach have different yet complementary focal points, and when used together can help solve business problems better. The IT4IT standard is focused on managing the business of IT whereas VeriSM is an organizational-wide approach to service management. They also have different functions, since VeriSM is an overarching approach which helps organizations to govern multiple practices and technologies under one flexible model, according to the needs of the business, whereas IT4IT is a normative standard that aids organizations in managing and optimizing the flow of information in the value chain to ensure alignment with business objectives across the value chain, drive automation, and support service brokering and SIAM practices. As such, VeriSM and the IT4IT standard are complementary. The synergy between the two approaches, in terms of their holistic view and mutual focus on generating value, makes them very suitable to be combined together to help organizations to take advantage of the opportunities offered by the digital age; and to ensure that their IT capability is digital-ready, and operating in alignment with the rest of the organization. (Please note that the links below are good at the time of writing but cannot be guaranteed for the future.) For more information on the IT4IT™ standard, please see: www.opengroup.org/it4it. For more information on VeriSM™, please see: www.verism.global. In 2017, The Open Group and the IFDC signed a Memorandum of Understanding (MoU) with the intention of joining together to proactively help the market to address the challenges of today’s demanding environment. The Open Group and the IFDC are both community-based organizations and as such are well positioned to take feedback from the community to accelerate the ability of organizations to respond and adapt to the digital age. Further information on The Open Group is available at www.opengroup.org. The International Foundation for Digital Competencies (IFDC) is a global non-profit organization and a global thought leader in the area of digital competencies. The mission of the IFDC is to develop, own, maintain, and promote (open) standards and approaches for the development of professionals in the digital era. The IFDC has strong partnerships with industry-leading organizations and revenue is generated by membership as well as royalties from publication and certification sales. Taking a community-based approach to the development of new approaches and standards, the IFDC protects any content developed from commercial interests. VeriSM™ is the first of the approaches to be developed by the IFDC. Further information on the IFDC is available at www.ifdc.global.